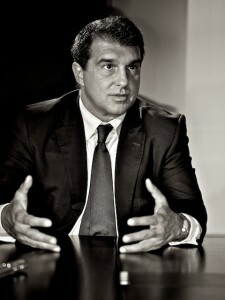 On Friday I was finally given the time and place to get some shots of Joan Laporta for a magazine. 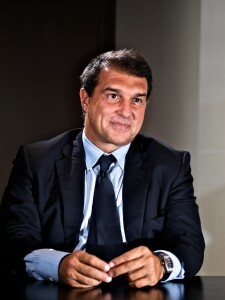 These are quite interesting times if you live in Barcelona as the local elections are kicking off in October. Ironically I have already photographed Jose Montilla for his campaign website, these guys are competing for control in the parliament. This shoot was quite different. For a start a dozen people did not turn up and try to ‘handle’ the whole show; there was just one guy who, perhaps new to the business, had not yet learned how to be a ‘pitbull’ advisor. Time was limited and I was essentially shooting while Nicola (the journalist) asked questions, this of course leads to the problem of eye contact which most editors would prefer to have, but I am less obsessed about. My biggest problem was me. I was determined to try something different and more complex with the lighting, I wanted something more moody/ hard and ended up using 2 or 3 lights with grids and a snoot, in retrospect I think a shoot thru would have been better for the main light for colour images, but I like the effect when converted into B&W, the skin texture is very strong but this is tolerable because the shallow depth of field means the area of extreme detail is not overpowering. I am still working on the shots so cannot be sure how the colour ones will turn out, but the B&W versions I did for myself are probably what will work best.